So September 2017 is here, and so is our September 2017 Calendar Desktop Wallpaper for download. 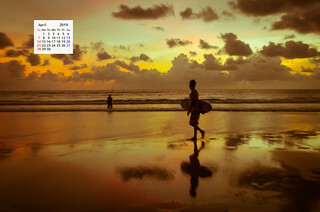 This months picture features a Surfer around Sunset on a Bali Beach. The Kuta Beach in Bali is one of the most happening beaches around and you can find a lot of action happening here from people jogging, surfing on the waves, couples photographing on one hand on the other hand the beach has many quiet places where you can just sit and watch the waves without a worry in the world. This image of the Surfer in Sunset from the Kuta Beach is a very special one as this was clicked on my last day in Bali, Indonesia on the Trip of Wonders. On most of my trips, I just hope I will get one picture that I can share on my annual desi Travel Calendar so that I can recollect the memories later. 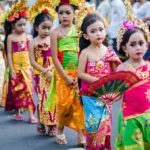 But look at Indonesia, it is such a picturesque country that I decided to have a year-long focus on my trip to Indonesia and share one picture every other month from Indonesia on the calendar. This is the 5th picture in the Trip of Wonders Series on the desi Calendar and all I can say is we have just scratched the surface, or considering Indonesia is a country of 17,000 + islands we have just touched the sand on the beach. So coming back to how this image of the surfer in sunset was made. One by one most of the surfers came back to the shore, except for this one, and I noticed him for some time playing alone with the waves. But he was too far in the ocean for me to click him while surfing ( Note to self > The dream of clicking a surfer riding waves is still a dream 🙁 ). As the light was fading and darker clouds were appearing on the horizon I was getting ready to go back to our farewell dinner organized by our wonderful hosts from Ministry Of Tourism Indonesia. But then I had a strong desire to click this surfer as and when he came to the beach. As my luck would have it, not only he came back to the beach he actually started walking parallel to where I was standing, but there were many people on the beach at that time and I would have never got a clean shot of him. So I immediately ran parallel to the beach and found a spot where there was nobody between me and waves and hoped that the surfer will not stop before reaching this spot. Just as he was about to pass in front of me I noticed a girl running towards me in the other direction and I was pretty sure she will pass in front of me just as the surfer will and ruin my shot. Just as I braced for the situation, a large wave came towards the beach and the beach in front of me was drenched in frothing water. The girl noticed this and immediately changed her direction and passed behind me and not in front of me. Now just as the froth on the water settled and the returning waters formed a perfect reflective layer on the sand our surfer passed right in front of me. I was ready with my camera and clicked in rapid succession. You see the surfer well-lit even though it was brighter behind him is because I fired the flash of my camera at low intensity to illuminate him and avoid a silhouette. Thus one of my favorite images from the trip of wonders was made on Kuta Beach in Bali. 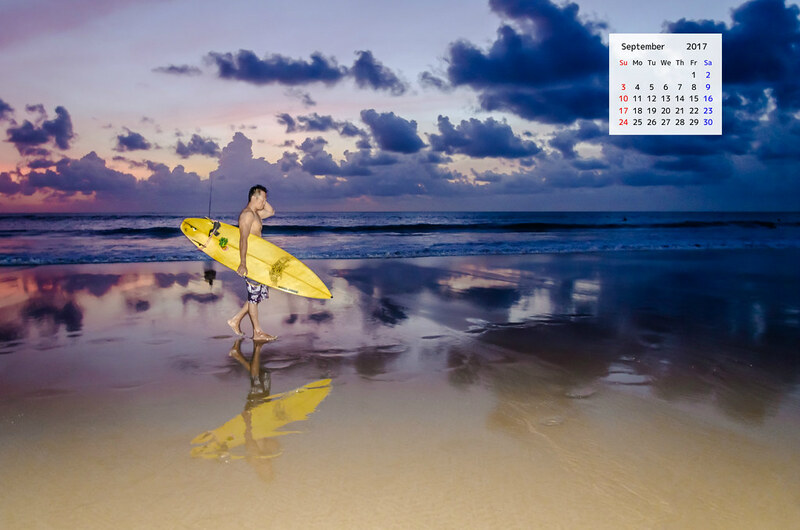 Dear reader, I hope you like this image and the little story about how I made this image of the ” Surfer in Sunset on a Bali Beach” Next visit to Indonesia I hope to fulfill my dream of catching a surfer playing with the waves. With this, I invite you to download your free copy of September 2017 Calendar Desktop Wallpaper. 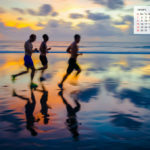 As always the desktop wallpaper calendar is available in 3 sizes and can be downloaded by just right clicking and saving them on your machine. The images are in high-resolution at 300 DPI and you can take high-quality printouts with them and I will be more than happy if you share them with your friends and family. Wishing you all a happy and Smiling September. What a neat capture! And so much work behind it!